Info Edge India, that runs sites such as Naukri.com and 99acres.com, witnessed a 58 per cent rise in standalone net profit to Rs 28.2 crore and a 28 per cent rise in net revenue to Rs 91 crore for the quarter ended September 2011. In the conference call following the announcement of its quarterly results, the company's brass discussed specifics of the quarter, how the slowdown is affecting Naukri.com and Quadrangle (recruitment services arm), Jeevansathi's status quo, the fluctuation in 99Acres.com's traffic rank by comScore, how the six start-ups it has invested in are faring and expectations from them. On Naukri.com, 12,100 CVs are added on a daily basis and its database now has over 27 million CVs. The average number of CV modifications per day grew to about 98,000 in the quarter ended September 2011. Naukri's market share, according to comScore, is now 61 per cent. IT as a contribution to Naukri's sales continues to be between 25 per cent to 26 per cent and the company claims to have met with success with large IT and IT services firms. Sectors such as insurance, telecom, real estate have been impacted more than the other sectors for hiring. Though the slowdown has occurred across the board, no comparisons are being made with the slowdown of 2008-09 as yet. In 2008-09, Naukri faced a slowdown and collections in some quarter dropped by about 30 per cent. Discussing the reasons behind the fall in growth of collections from clients, Hitesh Oberoi, MD & CEO, Naukri, said, "It has got more to do with the economy than anything else because the economy is slowing down there is a lot of negative press around what is happening in the rest of the world whether it is a debt crisis in Europe or whether it is inflation or whether it is interest rates. People are again being little cautious and that is seen in our collection." Oberoi said the company is not in a recessive mode as yet and is still growing. He said collections in the quarter have grown slower than revenue growth because the latter benefited from deferred revenue brought forward from the previous quarter. Quadrangle has suffered in the quarter from fall in business from a large IT customer, which has resulted in sales declining by 22 per cent. Net sales from Shiksha.com, its education portal, grew by 78 per cent. 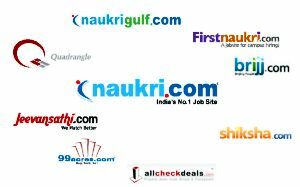 Jeevansathi.com continues to be ranked a distant number three in online matrimonial classifieds space. Revenues have grown by 15 per cent to 18 per cent year-on-year but the company is yet to figure out a way to reach its target of 30 per cent to 40 per cent year-on-year growth. "It is still a challenge so we are still trying sort of figure out how we can become a leader in some communities at least," said Oberoi. The strategy for the website is to become the top player in West and North regions. "It is not important to be a number one player nationally as long as you are number one in certain committees, you are number one in those communities and that can improve your margins substantially," said Oberoi. Its offline strategy is on hold "the company had set up 13 to 14 offline outlets for Jeevansathi but has not expanded the network. It is instead working on a call centre model. Various factors are currently affecting the global real estate market including high interest rates, high prices in most markets and local issues. These have affected the classifieds site 99Acres.com as well. Net sales at 99Acres have fallen quarter on quarter, but were up 41 per cent year on year, in the quarter ended September 2011. A change in the methodology used by comScore has resulted in a fall in traffic share of 99Acres.com over the last few months. Apparently, comScore's move from a panel approach for collecting data to a tagging methodology and this has resulted in traffic share of 99Acres falling from early 40s to late 30s. Stating that none of the measurements used to evaluate websites is precise and that Info Edge looks at comScore and Alexa and Google trends as directional inputs, Sanjeev Bhikchandani, Vice Chairman and founder, Info Edge India, said that 99Acres's market share is now at 21 per cent, up by 2 per cent. Info Edge believes some portals - 99acres, Shiksha and Jeevansathi, need a little bit more marketing and may invest more in advertising despite the third quarter typically being a lean one for the company when it comes to advertising. Start-ups & Future Investments Discussing follow on rounds in start-ups that Info Edge has invested in, Bikhchandani said, "The places where we have seen a second round happening pretty soon after the first round those which either are extremely capital hungry like e-commerce or else there has been significant competitive reasons and therefore the company has to morph to second round very fast." Info Edge will keep an "open mind" about introducing external investors into these start-ups, depending upon requirements of the sector. The company has said it is not going to run up a portfolio of 10 or 12 very capital-hungry start-ups which it will fund entirely on its own. "We would be a little bit conservative about this but having said that we will trade by as the market evolves," he said. In the six start-ups that it has invest in so far, Info Edge has witnessed Rs 23 crores in top line, according to Bhikchandani. He expects this to "more than double". They have incurred an EBITDA loss of Rs 14 crore in the first half of the fiscal and this will continue to rise as the start-ups are still in investment mode. EBITDA losses are expected to also double. The company does not plan to exit any of its investments immediately. Bikhchandani said, "Right now we do not have any outlook to exit anything but like I said in a market which matures and as companies get valuable and we would keep an open mind but right now we are not looking at exiting anything."